The wealth of our region is rooted in Native lands and communities—and we’re committed to both acknowledging and honoring that history. That’s why we devote 40 percent of new grant dollars to Native-led organizations working to advance economic, social, and cultural prosperity in the communities that anchor our region. In 2018, we completed an evaluation of our first five years of funding, from 2012–2016. The evaluation findings show that since 2012, we’ve remained committed to investing 40 percent of our annual grant dollars in support of Native-led organizations. 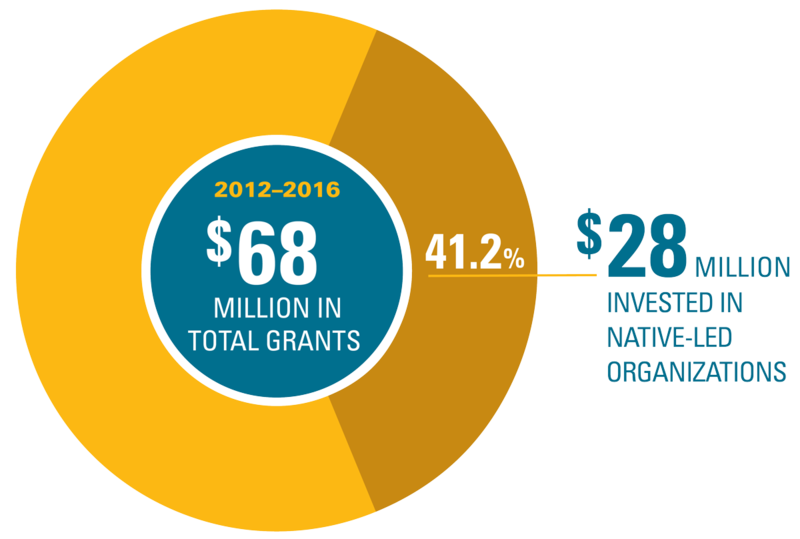 From 2012 to 2016, we invested more than $28 million in Native-led organizations, which is 41.2 percent of NWAF’s $68 million in grants during that period. Our 40 percent commitment carries into the future, and our funding focuses on supporting efforts that produce good jobs, financial capability, and community wealth-building in Native communities. Our goal has been, and will continue to be, to increase meaningful economic productivity within Native communities. Supporting lasting change by investing in Native-led organizations advances good jobs and financial capability through our four grantmaking portfolios. Opening access to capital connects people to resources. Expanding work opportunities gives people pathways to quality jobs. Supporting enterprise development drives entrepreneurship. Promoting financial inclusion gives families tools to climb out of poverty. Our portfolios are mutually reinforcing, and we recognize that an investment in Native-led organizations through any one of the portfolios has a positive impact on each of the others. As we move forward, we’re continuing to emphasize the intersections and connections among the portfolios. Prior to 2012, 30 percent of our new grants went to Native-led organizations. This was a start, but we recognized that with a larger commitment, we could have a greater impact and create more opportunities for lasting change. We wanted to advocate for more funding for Native communities and to show what was possible through our example. We must collaborate with other funding institutions working in our priority communities to build stronger ties between tribal governments, state and federal agencies, and our Foundation. We need to keep improving our understanding of the context of the communities we serve, using the expertise of our grantees to deeply inform our grantmaking approaches. We must continue to make grants based on models that grow economic systems in Indian Country and that are rooted in Native culture. Our broader vision of increasing good jobs and financial capability in Indian Country will result from a pipeline of opportunities including job training, small-business and social-enterprise development, financial education, and access to capital. We’ll be updating this page periodically with more learnings, insights, and stories as they emerge. We’re committed to Native communities for the long term, and to continually strengthening our funding approach as part of that commitment. If you’re from a Native-led group in our eight-state, 75 Native nation region, give us your contact info and a detail or two about how your work connects to our four funding portfolios. We’ll keep your info on file for updates and to contact you if/when there are opportunities for further engagement. *Short description: Which portfolio/s does your work connect to and why?